A single bottle of Bollinger Grande Annee Vintage Champagne. The current Vintage is 2007. This is an iconic Champagne favoured for its great taste and we present it in a wooden gift box together with your own personal message. 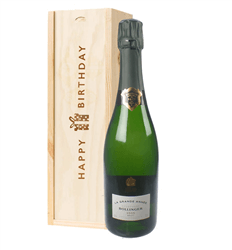 Since its foundation in 1829 Champagne Bollinger has been producing great Champagnes with a powerful, sophisticated and complex style. Champagne Bollinger has a family history in Champagne of over 180 years and is custodian of a heritage which has patiently been established during the decades. A Champagne house with a venerable history and tradition, it is now run by the great-great grandson of the founder Joseph Bollinger, thus retaining the family ownership and legacy, and is one of the relatively few independent, family owned Champagne houses still remaining. Aside from making great champagne, Bollinger is best known for its association with the James Bond movie franchise, as the favorite bubbly of Britain's most famous fictional secret agent. The world's most famous secret agent has long been associated with Bollinger Champagne. It made its first appearance in the 1973 007 film Live and Let Die, and has been featured in every James Bond film since. Wine lovers like to recite the famous quote "I drink it when I'm happy and when I'm sad. I trifle with it if I'm not hungry and drink it when I am". Bollinger ages their non-vintage wines three years, and the vintage wines five to eight years. Champagnes are riddled by hand. You can always count on Bollinger Special Cuvee to exude fruit, spice and nut-like qualities, all topped with a fine mousse that refreshes and delights the palate. When you want to impress a dinner guest, or offer a special gift.